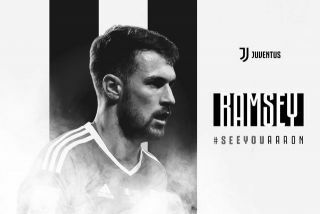 Juventus have confirmed that Aaron Ramsey will arrive in Turin this summer as Massimiliano Allegri will see his midfield options strengthened. As per the club’s site, they announced a contract has been signed by the Welshman as he’ll join on July 1, after his current deal with Arsenal expires. In turn, they’ll undoubtedly look forward to having him at their disposal next season, and it does present a welcomed headache for Allegri, as he’ll have to find a way to fit the 28-year-old into his current line-up. Other changes could still be made to the squad over the summer, and so it remains to be seen whether or not this is the preferred system and personnel for the Italian tactician. Further, it still leaves out various key individuals hoping to continue to play a fundamental role for the reigning Serie A champions, but those decisions will be down to Allegri to make to ensure that they continue to dominate domestically while also continuing to establish themselves as genuine contenders in the Champions League. Ramsey also offers tactical flexibility given he can be deployed in various roles and positions, but perhaps the line-up below is the most balanced of them all. It would see Juve’s latest addition play in support of Cristiano Ronaldo who will lead the line, with Paulo Dybala offering support on the other side. Blaise Matuidi, Miralem Pjanic and Rodrigo Bentancur could provide a balance of energy, tenacity and creativity in midfield, while it’s a familiar looking backline. It remains to be seen if Ramsey is given a more advanced role or if he plays as part of a midfield three, but that is arguably one of the benefits of signing him as he’ll have to change his role at times too with Juve looking to compete on multiple fronts, giving Allegri a versatile option when rotating. Juventus XI: (4-3-2-1): Szczesny; Cancelo, Bonucci, Chiellini, Alex Sandro; Bentancur, Pjanic, Matuidi; Dybala, Ramsey; Cristiano Ronaldo. (as per Corriere dello Sport).